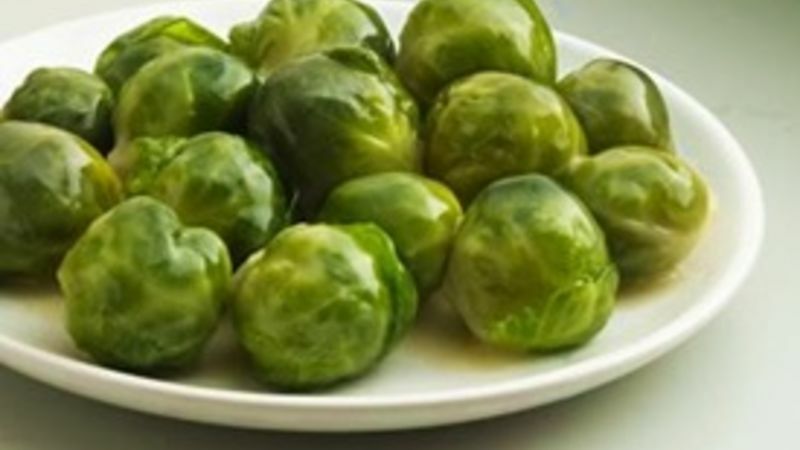 Preheat the oven to 450° F. Remove any wilted or yellowed leaves from the Brussels sprouts and trim the stem close to the heads. Cut each head vertically into thin slices. Break the onion slices apart into rings and add to the sprouts along with the garlic and a light sprinkling of salt. Spray generously or drizzle with olive oil, toss the vegetables to coat them lightly with oil, and spread out evenly in a thick skillet or non-stick baking dish. Bake for about 15 minutes, or until the vegetables are lightly browned and tender, stirring once or twice as they roast. Serve hot as a side dish.